Radiator Blog: More talk, more rock: on algorithmic game narratives, speculative narrative design futures, and "Shakespeare." More talk, more rock: on algorithmic game narratives, speculative narrative design futures, and "Shakespeare." Last time, I wrote about procedural narrative in the context of "process intensity." Here, I expand more on designing the procedural / process part. "I just want story to be talked about as a gameplay element that sometimes isn’t there. It’s part of the set of tools that a game designer uses to create an experience – and it should be thought of along the same lines, as physics or AI or something more mechanical." Part of the stigma is that AAA already commodifies narrative, and at its worst, it does it really poorly: I imagine a team of stubbled grad students, handcuffed to their desks in a flooded basement in Brooklyn, diligently typing generic dialogue into the "Soldier_Idle_Bark" spreadsheet for their free-to-play Chinese MMO overlords. The more important task here is to attempt some "vision" -- to map out which dimensions of game narrative aren't represented yet, and give those dimensions some space. A year and a half ago, it seemed one of those dimensions was procedurality, and to me, it still is: there is still no strong implementation of procedural narrative in a non-IF video game, none strong enough to inspire a whole new workflow in game dev culture as everyone rushes to copy their way of doing things. Predictably, the interactive fiction community is furthest along in this type of thinking. Nick Montfort's interactive fiction system "Curveship" separates story from narration. It makes a distinction between "fiction" files (the game, world, characters) and "spin" files (how the game, world, and characters are represented and narrated). This system design kind of resembles literary theory's divide of fabula vs. sujet, the difference between plot ("the raw material of narrative") and a story (the way plot unfolds), so that you can teach your computer how to narrate the world in a misleading or nonlinear way, or maybe switch narrators, or maybe even download someone else's narrator. Very interesting research. Login is a scene. Login begins when play begins. Login ends when player is not worried. Online is a scene. Online begins when player is in adventurers' lounge and map is in adventurers' lounge. [...] Logout ends when player is real. There are parts in the code where Munroe has written paragraph-long passages that appear, verbatim, in the game. That workflow resembles traditional games writing: same text goes in, same text comes out, though few video games would directly code narrative like that without scripting in some other format. However, much of Guilded Youth's text (as with most other interactive fiction, really) is also algorithmically generated -- not just because the system understands the grammar of language, but because this system also understands a certain grammar of stories / worlds / behaviors. Because code isn't just instructions to a computer. There's a theory and art to it; code is a way of thinking. So, the difficulty in writing interactive fiction isn't just a code syntax barrier. It is also about understanding this very different idea of what the writing involves, and what storytelling means. Curveship has a "world" with "concepts" that allow "actors" to "focalize." Undum has "situations" that afford certain "actions" to change certain "qualities." And Inform has this really complicated-looking scary flowchart just to explain what the basic backend does, barely even touching on how to engineer complex stories and worlds. Note that very little of this design is arbitrary, because simulations can also backfire horribly if over-designed (see Storytron)... What scares me more is that the IF gods deemed this magnitude of conceptual complexity to be necessary in order to write decent systemic stories. Is it possible to engineer a simpler, but still somewhat flexible, narrative system? With that in mind, here's the working spec of the current narrative system I'm working on, currently codenamed "Shakespeare." Systems-wise, it is a hybrid between Ruskin's conversation system, traditional game engine entity frameworks, and various interactive fiction designs. It's still heavily under development, of course. To Shakespeare, stories are made of concepts and actors. Actors are usually humanoid NPCs, but not always human and not always NPCs. There are three types of concepts: World, Talk, and Plot. A WorldConcept is like a room or a thing in the room, e.g. "DiningRoom" or "Table" or "Human." A TalkConcept is like an idea an actor says aloud and possible ways to say it, e.g. the "Greeting" concept could be expressed with "Hello" or "Hi" or "Hey." A PlotConcept is an event that happens at a WorldConcept, casts appropriate Actors in roles, and makes stuff happen, e.g. the "DinnerPartyIntro" concept would pull actors into the "DiningRoom" and make them speak "Greeting" to each other. More specific concepts can inherit qualities of vaguer, more general concepts. "Room" >> "LargeRoom", "PublicRoom" >> "DiningRoom"
"HeavyThing", "Furniture" >> "Surface", "Container" >> "Table" >> "FancyTable"
"TalkGreeting" >> "TalkGreetingRich", "TalkGreetingSmart" >> "TalkGreetingProfessor"
"Gather" >> "PartyIntro" >> "DinnerPartyIntro"
Shakespeare prioritizes more specific concepts, but can always fallback to vaguer concepts for whatever reason. There are 5 actors in DiningRoom, so the room calls the DinnerPartyIntro concept, which looks for a nearby actor who knows the TalkGreetingProfessor concept. Eddie knows it. However, all the TalkGreetingProfessor dialogue lines are on cooldown because other people spoke them recently, so instead he falls back to speaking TalkGreetingSmart instead, which still fits the situation. DinnerPartyIntro calls DessertParty, but there is no DessertRoom in the house, so it falls back to PartyGeneric, which looks for a room that inherits LargeRoom and PublicRoom -- it picks LivingRoom, since that's more specific than either of its ancestors. Actors have memory, remember concepts, and can share concepts. Only actors with (or maybe without) certain concepts will get picked by certain PlotConcepts. Eddie has been in DiningRoom, so he remembers where DiningRoom is. Someone can ask him where any DiningRoom is, or if he's been to a specific DiningRoom. The professor heard Eddie say TalkGreetingProfessor, so the professor will remember Eddie, and that Eddie said that in the DiningRoom. If someone asks the professor about Eddie, she might tell them about her memory of Eddie if there's nothing more specific available. The UnknownConnection PlotConcept might look for an actor like Cooper, who doesn't have the specific DinnerPartyIntro memory but knows Eddie and knows the professor. UnknownConnection will bring Cooper into the room and have him say TalkIntroduce about Eddie; the Professor will verbalize the DinnerParty memory; Cooper will say TalkSurprised or maybe TalkSurprisedAngry. TalkSurprisedAngry might trigger a PettyArgument concept, etc. Anyway. This can obviously get really complex -- but if it does, it might be because the writer wrote too much and wasn't using their concepts efficiently and simply. You can be as complicated or as simple as you want. De-emphasize the myth of psychological realism as narrative simulation / the basis of action. Actors in Shakespeare do not have emotions or moods (unless you give them some, I guess) because fictional characters are not actually people. Instead, concepts guide characters. The "conceptual reality," however, is still intensely psychological and epistemological. If no one remembers it happened, then maybe it never happened. I'm still very interested in how to reflect memory / reality in games. 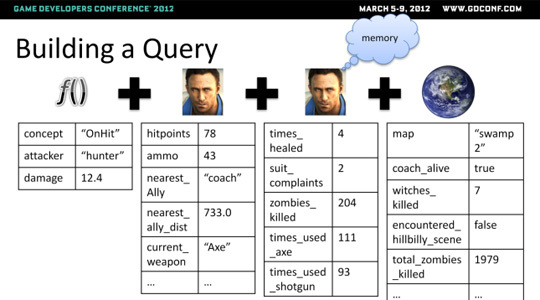 Argue that narrative isn't really an AI problem, it's more a workflow / transparency problem. We need a system that makes it easier for writers to design narrative, yet with some of its working and causality painfully and automatically explained to the player. Instead of the player walking through a static branching structure, the game will dynamically build / mutate a network structure around the player. You simply author the nodes; the game will link them all automatically, and mutate new nodes based off of yours. This is the "self-branching" aspect that Ruskin talks about. The structure is less like a tree, more like a network. A densely connected network is more resilient than a tree, with redundancy and fallbacks built into its structure. 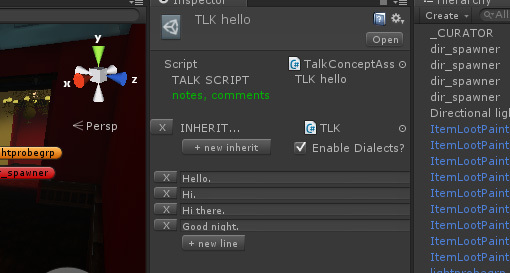 Once you build a generic concept library (stuff like "Room" or "TalkHello") you can re-use that library in other projects and have some narrative simulation running in any other game within minutes. Maybe you could download a "romance" library off Github, and fork it to add lesbian romance as a feature? Maybe there'll be a CGTextures or Turbosquid of narrative? Simple writing interface, compartmentalize data so you don't end up staring at a spreadsheet or web of nodes, encourage simple concept structures. You shouldn't have to stare at a complex network editor in order to generate a complex network, though maybe some sort of graph visualization would be good for debugging your plots. Most of all, I'm going to try to keep the framework ostensibly simple: three main data types, simple editor that gets the job done.